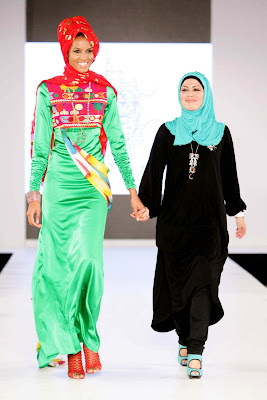 Muslimah fashion is steamrolling across the world, and it looks like Rabia Z is certainly leading the way! On March 20th she showcased her collection at Miami International Fashion Week to applause and a standing ovation from the audience. 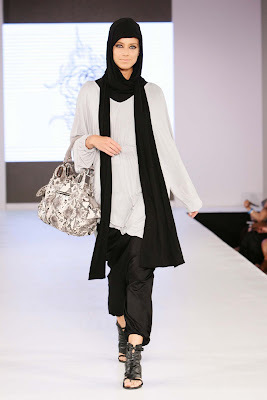 And what's more, Rabia Z will also be taking part in Pakistan Fashion Week in a few days time! Salam! Congratulations for your fantastic Blog! It is modern, lovable and full of life! I love love LOVE her designs! Mashallah! I think this has to be one of my favourite collections from Rabia Z; Wish her all the best for Pakistan Fashion Week and for the future. 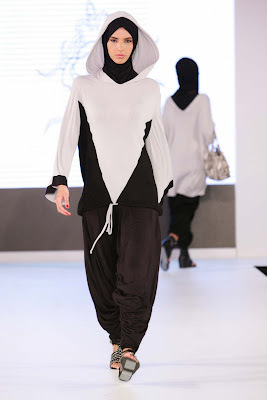 mashallah Rabia, congratulations on your exclusive design!! Its always a pleasure to see wat our Muslima are putting out these days and making a name in the fashion world for all of us who are muslim!! keep up the good work!!Alhamdulillah! Her work is absolutely stunning mashallah. Love the way she designs her clothes so that they are totally wearable. A big inspiration to me :). Salaams, I really love the colors and style of the first outfit. The last one is not that bad either. I even like what Rabia's wearing. Niiiiice. 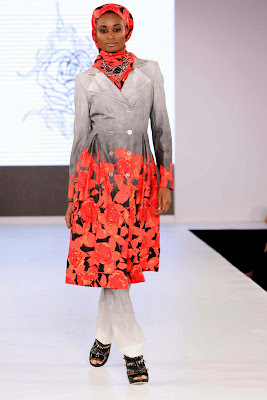 Really love the colletion...Best of blessings for her for designing modest fashionable clothing. She is so beautiful too...I often am wondering how Rabia puts on her hijab. Really love the way it drapes. So elegant. Here is some of the clothes from her show. I love love the second one in action haha. I bet you think I am some sort of a stalker, but I seriously typed Rabia Z on youtube and that came up. :D Enjoy and hopefully you can post it in the blog so other sisters can see her designs and gain inspiration. 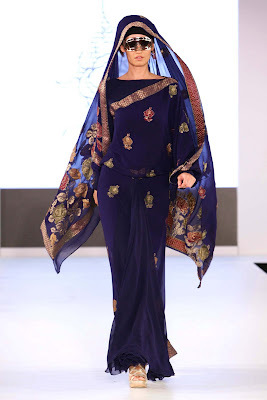 The dark blue saree inspired look is sooo good..just so elegant and gorgeous..beautiful collection. Lots of cool designs here. I wish I could buy them! i loveeeee the sari-esque outfit on the top right mA! Do Maxi dresses look better with heels or flat sandals?